Apart from the actual mixer, the design of the mixing tank is the single most important factor in producing a successful result in any process. In order to allow optimal performance from a mixer’s impeller, it is essential to create an environment that supports both correct impeller positioning and appropriate liquid coverage of the impeller. Incorrect positioning negatively affects the performance of a mixer, the quality of a product, and may even be detrimental to the performance life of the mixer drive. When looking at tank designs, vertical cylindrical, and square or rectangular tanks are most common. In the process of selecting the optimal tank design for an application there are certain rules of thumb to observe. For most mixing applications the ideal liquid level to tank diameter ratio is 0.8, however, any ratio that is close to 1-to-1 is sufficient. A ratio that is too small does not allow proper axial mixing in the tank. Anything less than a 0.6 ratio should be avoided. When the ratio is in excess of 1.4, dual impellers should be employed. 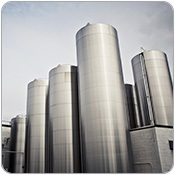 Any time that the liquid level to tank diameter ratio exceeds 2.0 the tank selection should be re-evaluated, as these slim tanks are not the most cost-effective solutions for mixing. As you can see from the table above the typical mixer price almost doubles. 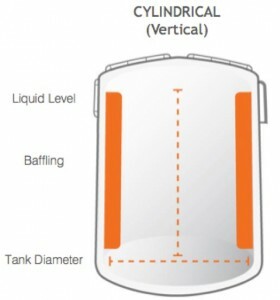 Vertical cylindrical tanks are the most common type of tank in use. A key consideration for cylindrical tanks is to ensure that they are either baffled or offset-mounted to prevent swirling from occurring. Refer to section 2 below (“The Use of Baffling”) for details. Generally baffles are not required for smaller tanks (<5,000 gallons in volume or <10’ height). However, for larger tanks, it is much more cost effective to install baffles than to invest in a more expensive, more heavy-duty mixer that is offset-mounted. Rectangular tanks have an equivalent diameter that can be calculated by taking the square root of Length x Width and multiplying it by 1.13. A similar liquid level to equivalent tank diameter ratio of 0.8 applies. Rectangular tanks can be effective when used for blending, as these tanks are self-baffling. However, rectangular tanks are not recommended for solid suspension because packets of solids will form in the corners. These “dead spots” will occur in a tank with corners. Therefore, a greater level of mixing is required than is needed in a cylindrical tank of equal size to achieve a similar result. Some tanks will have a round (dish) or cone bottom. Below are some standard guidelines about approaching mixing for these tanks. Cone bottom: Ideally the cone angle should be less than 15°, but anything less than a 30° angle is acceptable. If a cone is too deep, it just becomes that much more difficult to provide good mixing inside it. Round Bottom: The same rules apply for a round bottom as for a cone. Generally a round bottom is better for solids suspension as there are no sharp angles in the tank, so it eliminates dead spots. Baffles: If a cone/round bottom tank is very deep, baffles can be put inside this part of the tank as well, to promote good axial mixing and prevent swirling from occurring. Rectangular tanks are self-baffling, so the use of baffles is a requirement when using cylindrical tanks only. If an agitator is center-mounted in an un-baffled cylindrical tank, it produces a swirling motion, which is very inefficient. As an example, imagine two particles swirling in a circular motion, they will always be chasing each other and will not mix. Install Baffles: Installing baffles in the tank is the best option. Offset the Mixer: Mounting the mixer with an offset of approximately 1/6th of the tank diameter will prevent swirling from occurring. The drawback to this option is that the unbalanced forces will create greater stress on the mixer shaft and will require a larger heavy-duty mixer. This becomes cost-prohibitive for larger applications with shaft length requirements over 10’. 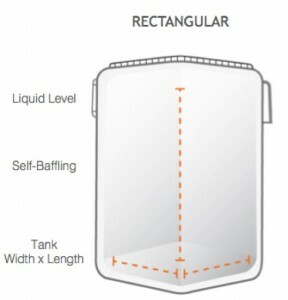 Baffles should fully extend the length of the tank, leaving some space at the bottom to avoid the build-up of solids. Therefore, the configuration for a 12’ diameter tank would be 1’ wide baffles mounted 2” off the tank wall. 1. In industrial applications of mixing in a vertical tank, what should be liquid height comparing with the diameter of the Tank . In a vertical tank, the liquid height to tank diameter ratio should be as close to 1:1 as possible, whenever possible. “Generally baffles are not required for smaller tanks (<5,000 gallons in volume or <10’ height). However, for larger tanks, it is much more cost effective to install baffles than to invest in a more expensive, more heavy-duty mixer that is offset-mounted"
So for smaller tanks, say, 2500 gallons of fluid, are you saying that swirling does not happen? Or are you saying that an off-set mixer is a more appropriate way of dealing with the problem? Swirling occurs in all unbaffled cylindrical tanks, irrelevant of the size. Installing baffles is the ideal solution, but if putting them in is not an option or is too expensive, offset-mounting the mixer is a good option for smaller tanks.